Part two of the Real Housewives Of New York is upon us, and it’s time for the hostility between Bethenny Frankel and Carole Radziwill to be paraded across the stage with epic ferocity. It’s the end of an era, folks. And watching last night’s reunion also signaled the end of Carole’s giving of any f**ks when it comes to Andy Cohen and the show. We pick up with Dorinda Medley defending her drunken slurring and JOVANI! heckling, which she claims was just a nice show of support for the business Luann De Lesseps refused to promote. Also, Dorinda maintains that she was not drunk when screaming at Luann in Colombia about “not having a mugshot!” Mmmkay. No one (not even Ramona Singer) believes a word of this. But Dorinda says she’s seeing a therapist now, which is helping her move through her pain. Will she stop drinking though? The answer is a definitive NO. Welp, folks. Just welp. I don’t know what to think as we head into the second installment of Real Housewives of New York reunion tonight. Being Andy Cohen’s first couch corral since Southern Charm, I believe he’s feeling empowered to speak his mind instead of playing meek moderator. However the cast isn’t empowering each other, or women in general, as accusations of nasty blogs and biting comments spew back and forth. Carole Radziwell and Bethenny Frankel are close to a throw down. The only one defending Bethenny more than Andy is Sonja Morgan, but it’s the former Carole accuses of being full of shiz. Yikes! Despite the shattered friendship, we will be treated to more Giovanni heckling from Dorinda Medley, as well as the revelation that Tinsley Mortimer’s on-off beau sees other people on their breaks. Also Ramona Singer explains the downfalls of gravity when you’ve got “that kind” of stomach bug. The theme for this year’s Real Housewives Of New York Reunion is neutral palettes and open hatred – a perfect fit for an occasion featuring this powerhouse cast of women. And last night, the ladies of NYC all lined up one by one to call each other on the carpet. But let’s be real, the TRUE theme of season 10 is pretty much “who-said-what-in-a-blog-about-whom,” and it’s not going to be long before Carole Radziwill will finally have to back her written words up with verbal sparring. Bethenny Frankel, everyone’s prime target, is ready. And last night’s Reunion, Part One, was just a warm-up. Despite the bad behavior to come, let’s pay homage to how fantastic (with some slight misses) this cast’s entire reunion look is. In particular, I’m obsessed with Sonja By Sonja Morgan $149 frock, which kind of boggles my mind. After Andy Cohen addresses the absence of Luann de Lesseps, he tosses out some softball questions. Bethenny is still happy in her apartment, Ramona Singer just put her NYC pad on the market, Carole gives us an update on Adam – which still makes zero sense – and Tinsley Mortimer’s big news is…a haircut. Yes, this is the equivalent of a storyline for Tinsley. Put on your sparkly dresses and grab your pinot and popcorn! Tonight is the first part of The Real Housewives of New York reunion! The ladies will gather to rehash the crazy season they’ve had, but without co-star Luann de Lesseps, who left for a second stint in rehab just before the reunion taped. I am still in shock after watching part one of the Real Housewives of New York reunion. The stand out moment that made me feel beyond awkward was when Bethenny Frankel alluded to Dorinda Medley doing drugs and Sonja Morgan chimed in. I could not believe what I was watching. Even at home, my face turned beet red from the vicarious embarrassment so I can’t imagine how the people who were actually in the room felt. 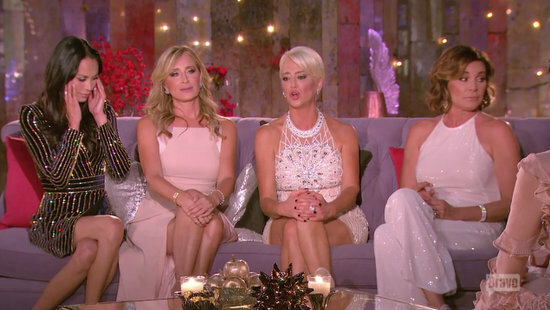 In a not-so-shocking turn of events, both Dorinda and Sonja made comments about that specific part of the reunion episode. 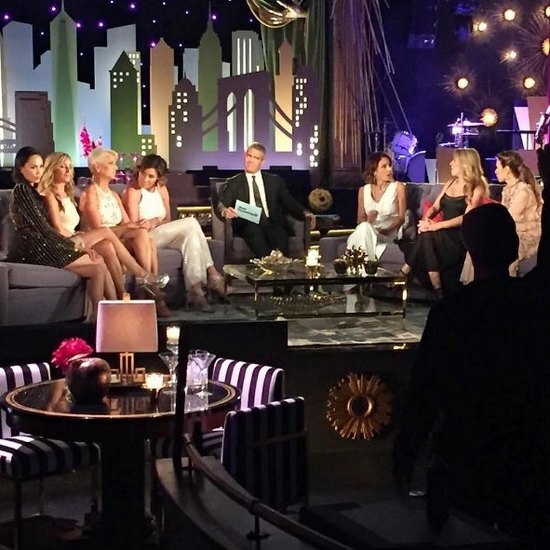 Preview – The Explosive Real Housewives Of New York Three-Part Reunion! We’ve been hearing for weeks now that the Real Housewives Of New York reunion is devastating, “terrible” and that the cast will never recover from the level of vitriol. True to form, Bravo is spreading all the gory details into a three grueling episodes. Part 1 which will air next Wednesday, August 31 at 9/8c, will focus on Dorinda Medley‘s relationship with John, which again, comes under fire from the other women, and Dorinda is forced to relive some of John’s most “embarrassing moments.” Meanwhile Luann de Lesseps is questioned about her ex Rey, who made quite a scene with Ramona Singer. Dorinda Medley Dishes On Luann de Lesseps, The Earth-Shattering Texts, The Reunion, And If She Stirs The Pot! Dorinda Medley recently did a Facebook Live chat about this season of Real Housewives Of New York. She showed up in a pair of $14.99 over-the-counter spectacles to dish on all the drama – including the reunion and Luann de Lesseps‘ relationship with Tom D’Agostino. Dorinda promises the next few episodes, featuring the salacious texts Bethenny Frankel possesses will be a major game-changer which will divide, not only the cast, but the viewers. Yowzers! This Real Housewives of New York season isn’t even over yet, but I am already pumped up for the reunion episodes. There is nothing quite like watching the Housewives argue with each other over the past season’s drama. Not only do I love to see the ladies rehashing the controversy, but I also love seeing them all spray tanned and dressed to impress while they try to take each other down. That contrast between them looking classy and getting catty is just too good to resist. There have been no clips released from the reunion yet, but thankfully the ladies posted some behind the scenes photos on social media. CLICK “CONTINUE READING” FOR THE PHOTOS!